Presently, this is the site of Bicol's magnificent Emerald Grotto of our Lady of Lourdes. In olden times, the hill was once the habitat of the Asuang (witch), the reason why the hill is referred to as the "orno" or "oven". 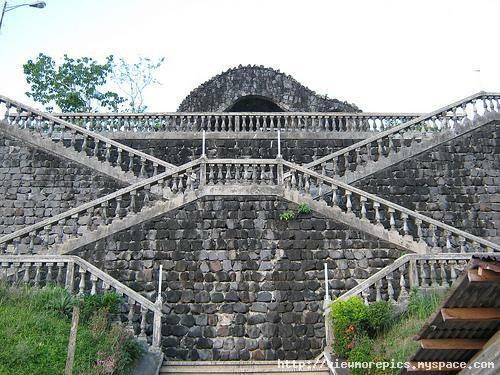 As the result of the angelization of the area the hill became the site for staging "Pagtanggal", the Iriga folk version of the re-enactment of the Passion of Christ, hence, the name "Calvario Hill". The first "ermita" or mission chapel of Iriga during Spanish times was erected here as evidenced by religious artifacts unearthened in the site. Opposite the Ermita the Casino Espanol was erected, a favorite converging are for Spanish rulers. When the Americans came at the turn of the century, this was converted into a base for its cavalry forces. During the Japanese occupation, a Japanese garrison was established on the hilltop, utilized as watchtower against guerillas. Many Filipinos met martyrdom in this area.